I knit a scarf in two shades of green. 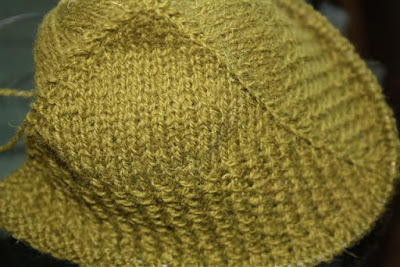 Just simple garter stitch. Of course I wanted a matching hat. So I knit another one of my Soulemama's favorite pattern. I think it;s the seventh I made, but I lost count. I still love making it. I still have a lot of that green yarn left, so I started a shawl again. This time I am following the pattern I saw at soulemama's and I do hope this one will turn out better than the blue one. And then I'm going to decide what to make with this beautiful yarn I just bought. I love it!